HONG KONG, 2018-Jan-17 — /Travel PR News/ — Wharf Hotels announces the opening of The Murray, Hong Kong, a Niccolo Hotel, as the group’s new flagship Niccolo property and the latest addition to the luxury contemporary chic collection by Wharf Hotels. The Murray will open its facilities, restaurants and bars progressively from today. As one of eight historic landmarks under the Conserving Central initiative introduced by the Hong Kong government in 2013, The Murray is an inspiring piece of architecture holding almost 50 years of history, and a landmark building located in the heart of the city in Central, Hong Kong. A high-profile preservation project converted into a luxury hotel by Foster + Partners, The Murray is celebrated as a pioneering example of sustainability. Designed with deeply recessed square windows, its ground-breaking energy efficiency concept is still applauded decades after it was built. These windows have been enlarged and now create a magnificent picture frame of the city skylines and garden vistas, thus allowing the hotel to continue its eco-conscious heritage. 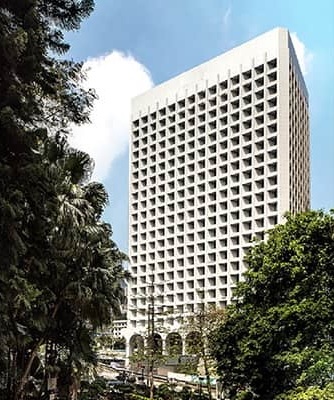 Emanating the spirit of discovery, Wharf Hotels, a wholly owned subsidiary of The Wharf (Holdings) Ltd, is based in Hong Kong and currently operates 16 owned or managed hotels under Niccolo or Marco Polo Hotels in Hong Kong, China and the Philippines. Niccolo Hotels was added to the group’s portfolio in 2015 as the new luxury collection, positioning the brand as contemporary urban chic. The Murray, Hong Kong, a Niccolo Hotel, opened in January 2018 as the brand’s flagship hotel, with 2 new Niccolo hotels currently under development in China following successful openings in Chengdu and Chongqing. Marco Polo’s deluxe hotels in established locations maintain their ethos to explore, discover and experience a destination, drawing on the philosophies of its namesake, Marco Polo: an adventurer, a traveller, an entrepreneur and a connoisseur of culture – just as Marco Polo’s modern travellers are today. Further details are available at wharfhotels.com. Niccolo is a collection of contemporary urban chic hotels with desirable, highly prized addresses. At heart, as Hong Kong, a Niccolo Hotel in January 2018. An additional 2 Niccolo hotels are currently under development discoverers and re-discoverers of luxury experiences, styles and tastes, its hotels are modern sophisticated spaces, where the timeless pleasure of impeccable hospitality from another golden era in travel, is valued. Underpinning everything is the desire to make life effortlessly luxurious. Niccolo Chengdu was the first hotel to open followed by Chongqing and the brand’s flagship, The Murray, in Changsha and Suzhou, China, taking the collection to 5 hotels. Further details are available at niccolohotels.com. This entry was posted in Hospitality, Hotels, Travel, Travel Management, Travel Services, Travelers and tagged Dr. Jennifer Cronin, hong kong, Niccolo Hotel, Niccolo property, The Murray, Wharf Hotels. Bookmark the permalink.